Introduction EMSL Analytical, Inc. offers PCR and traditional culturing methods to quickly and accurately identify the pathogen the causes Legionnaires’ disease. Recently, low levels of Legionella bacteria were discovered in a retirement center’s water system after a resident contracted Legionnaires’ disease. Immediate actions were taken to decontaminate the building’s water source and it has officially been deemed safe to drink. Legionnaires’ disease, a potentially fatal form of pneumonia, is caused by an infection of the lungs due to Legionella. Symptoms for Legionnaires’ disease may include fever, extreme fatigue, chills, coughing, diarrhea and/or cognitive impairment. Legionella is found naturally in the environment and in man-made environments, most often in water. Past outbreaks have been associated with cooling towers, water fountains, hot tubs and plumbing systems. This form of bacteria can be contracted when inhaled, also known as aspirated. 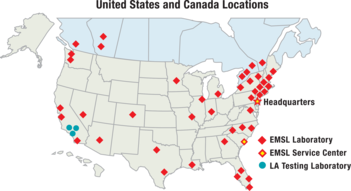 EMSL has 16 CDC ELITE laboratories throughout the United States and Canada that are even equipped to handle large projects caused by Legionella outbreaks. The laboratories provide Culture Testing, Polymerase Chain Reaction (PCR), Sequence-Based Typing and Whole Genome Sequencing. For more information about the difference between culture and molecular testing, please contact Christopher Goulah, Ph.D., at (716) 651-0030 extension 1407. For more information about EMSL’s Legionella testing capabilities, please visit www.LegionellaTesting.com. To view a complete list of the laboratory locations, accreditations and capabilities, please visit www.EMSL.com. For more information about EMSL’s laboratory services, please email info@emsl.com or call 1-800-220-36705.